Chris and Eddy specialise in 4wd, particulary Pajero's. They are Great people, extremely proud of their work and very helpful. I will also say fourby's for service advice and the best price on 4wd tyres and accessories. Had dealings with David from Off Road Industries. He was exteremely helpful and knowledgable. Did all my work over the phone and internet, never had a problem. Good prices, good service. Has supplied everything for my Patrol and Dads Cruiser. Has gone above and beyond normal service. Location: In Jims cupboard spying on him. I deal through them two regularly and they have never let me down. Highly recommended! 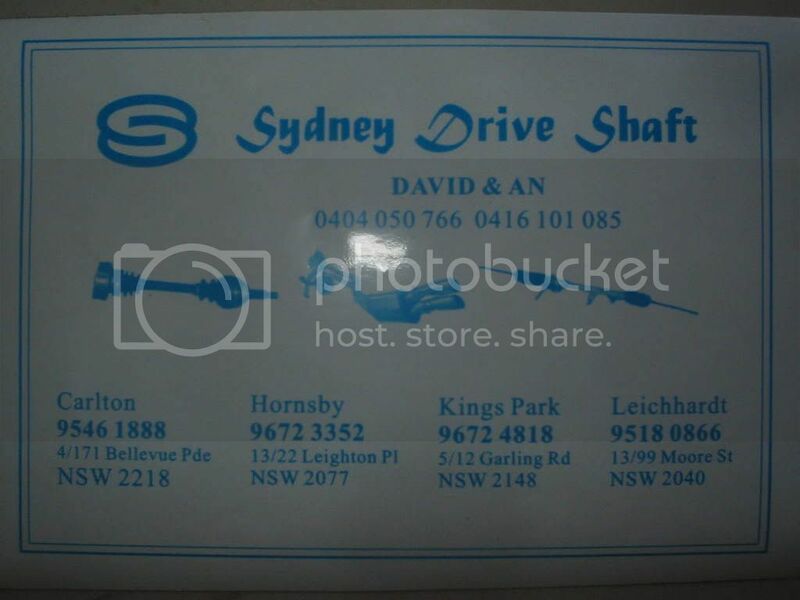 Just thought I'd let you know that on monday(public holiday) I rang Sydney drive shafts who are in the same complex as BBM. I was looking for a quote to replace the cv I smashed at Newnes. Didn't exspect a answer but to my suprise David (the owner) had the number diverted to his home. Now it was 8am when I rang him .He said "can you be at kings park by 8.30am. I,ll meet you at the factory." As it was I could and by 9am the same morning I was back at home with a new cv that David had installed onto the axle for me. The price was good and the service spectacular. After speaking with Dav he said he wants all you work to and will do just about anything to get it. So if your after cv's , exausts or steering racks give him a call. Here is his card. they also got a penrith store now. [color="RoyalBlue"]NH PAjero. Commodore 3.8 v6, 2" lift with 33 mtz's , a factory rear locker, custom snorkle ,custom rear bar, converted to duel fuel and a heat exchanger for constant hot water.[/color] . another work in progress. A Pajero with a difference. Formula Offroad in St. Marys - quoted me on some goodies as well as spares for one of their products, faxed me the invoice and had the goods modified to suit my 4x and dispatched to Canberra that same afternoon - gotta love that! got new springs and shocks. was going to open the shop on a public holiday so I can get the job done without taking a day off.